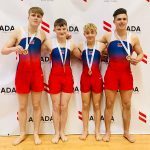 City of Birmingham Gymnastics Club Tumbler, Jaydon Paddock, today became a junior double gold medal winner at the 26th European Tumbling Championships. 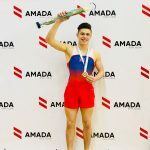 The event was held in Baku, Azerbaijan and Jaydon’s score of 71.300 placed him 0.7 tenths in front of second placed Diogo Vilela of portugal and 2.5pts ahead of third placed Arsenii Stephaninian from Russia. Jaydon’s second tumble run D score of 8.80 was the highest presented and went a strong way in securing his win. 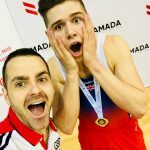 Jaydon’s All-around title win was also preceded by his Junior team championship win with fellow GB teammates William Finn (Wakefield GC); Jack Leahy (Milton Keynes GC) and William Cowan (Pinewood GC). 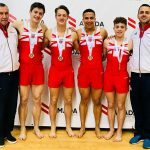 Further success for the City of Birmingham Gymnastics Club came from Kallum Mulhall who along with his fellow senior GB teammates, Kristoff Willerton, Greg Townley and Elliot Browne took the team silver medal place 4.5pts ahead of third placed Denmark and 0.4 tenths behind first placed Russia. 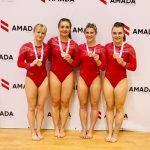 A big well done to Team GB for the amazing results and a special well done goes to Rachel Davies who currently trains with City of Birmingham whilst she is studying at the University of Birmingham and to GB & City of Birmingham Head Tumbling Coach Chris Porter.